Fairfield Museum and History Center is hosting its Third Annual Juried Photography Exhibition, IMAGES 2011, which will be held from May 1 to August 28, 2011. Serious amateurs, professionals, and students may enter. A direct link to the entry may be found here. 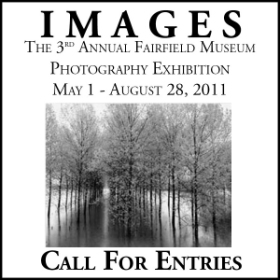 The deadline for submission is Monday, March 28, 2011. The exhibition will be juried by extraordinary photojournalist, Bill Eppridge (LIFE, National Geographic, Sports Illustrated), Adrienne Aurichio, photo editor and director of Bill Eppridge Photography, accomplished photographer Stephen Wilkes, and photographer and teacher Tom Mezzanotte. From the Fairfield Museum's website: "The Fairfield Museum will also feature a retrospective exhibition celebrating legendary photojournalist Bill Eppridge, whose storied career spans over fifty years. His iconic collection of work for magazines such as LIFE, National Geographic and Sports Illustrated captures many of the most important moments in American political and cultural history." Saying that Mr. Eppridge created many iconic images is an understatement, and I will write a more detailed description of his exhibit as that date approaches. His most recent book is A Time it Was: Bobby Kennedy in the Sixties; it shows RFK during his incredible, energetic 1968 campaign to which Eppridge was given all access, right up to its tragic end. There will be a Gala Preview (tickets are needed), and also a free artist reception and awards ceremony with the jurors on Sunday, May 1, 2-4 pm. The Museum is located at 370 Beach Rd. Fairfield, CT.